As you can see in this chart CU is definitely in the black, but only 5% of its revenue is profit whereas on average most of these schools net 11% of their revenue. It looks like Gordon’s losses are an exception, whereas Grace seems to typically struggle to stay in the black — 2001-2004 were also red years, including a -$600k deficit in ’01-’02. 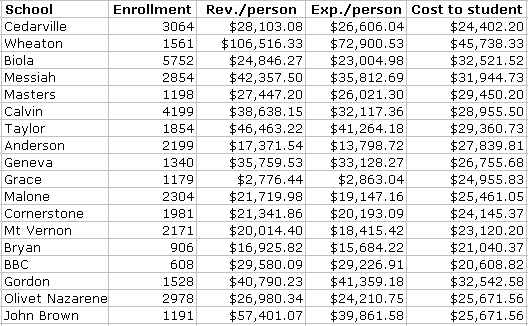 It’s also interesting to look at these numbers in terms of enrollment. “Expenses/person” describes how much it costs for the school to host/teach each student; ie, with all our facilities, professors, technology, etc it costs, on average, CU almost $27k for one kid to attend — but they only charge $24.4k. So if you want, you could say that nine of the schools here give you great value for your money (major assumption: the school manages its income well). The “Revenue/person” column is a reflection of how the school makes money: student costs + donations +investments + government support. Including the ’07-’08 year, donations at CU are down 22.3% since ’02-’03, but we’re trend upwards again. In the year we’ve been focusing on (’06-’07), Cedarville pulled in slightly over $7M (thanks to people like my friend Dave who calls alumni non-stop begging for gifts). This seven million made up 8.2% of CU’s gross, which is typical for the last few years here at CU, but well under the mean/median of 15.1/13.7% among these other schools. By this measurement, the most healthy of these schools is John Brown University, which received 40.4% of its gross from donations (Anderson University was doing very well too, at 32.3%). Also, note the small irony of CU’s populace largely composed of government-hating conservatives & libertarians yet nevertheless attending a school that is afloat thanks, in part, to the ~$1.6M we receive annually from Uncle Sam. BTW, Olivet Nazarene is a school I know nothing about except what their 990 tax forms have told me… but today I stumbled upon something else: their beer pong team is incredible. Make sure you watch the video. Just to be fair to CU, you are not highlighting the “profit margin” column enough. When the powers in charge decide budgets and cash flows for the next school year, they analyze previous trends in order anticipate what the future may hold, so the numbers you are posting indicate that the school is in fact not focused on profit, but on sound financial statements. As much as I dislike consumerism and wasted, they are doing a good job at keeping expenses in check; in fact salaries of CU senior staff and executives are some of the lowest in the “industry” and tuition is low compared to what else is available out there. I do however agree with you on the financial aid topic; even back when I was a student, the idea of aid was completely foreign to most, and I cannot for the life of me understand why it is not a priority for school administrators. I generally agree, though I’m not sure where the balance is. Too wide of a margin and I’m inclined to think some of that could be passed back to students; too little, and the school could have a hard time in a tough economy. For better or worse, CU seems to err on this latter side, giving itself less “wiggle room” when things aren’t going very well. Just to be clear, I wasn’t assigned to this story to dig up dirt and I don’t think any of us expected to find anything shocking. 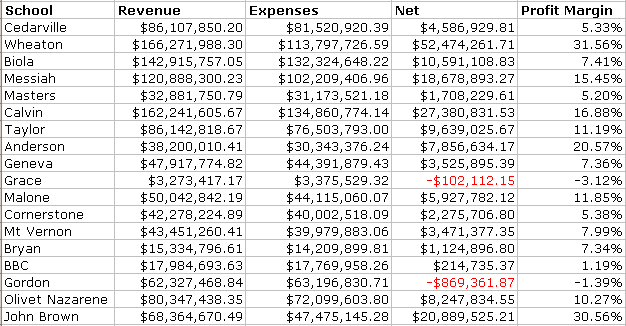 Perhaps the biggest surprise was how, in fact, CU’s financial were pretty solid overall. The numbers themselves have inherent interest to me, however, so that’s why I’m posting them. Kevin, I think a 5% profit margin is a good balance – it seems to be giving the school enough to put in the bank and mitigate unforeseen expenses…such as lawsuits from “persecuted conservative professors” and other similar things.